Leaders take their followers to prayer before God. Prayer Changes things, even the mind-set of God. Well after Moses was up on the mountain God tells him what the people are doing and tells him to go down the mountain to deal with them. God told Moses that he would wipeout all the people and make a great nation out of the descendants of Moses. 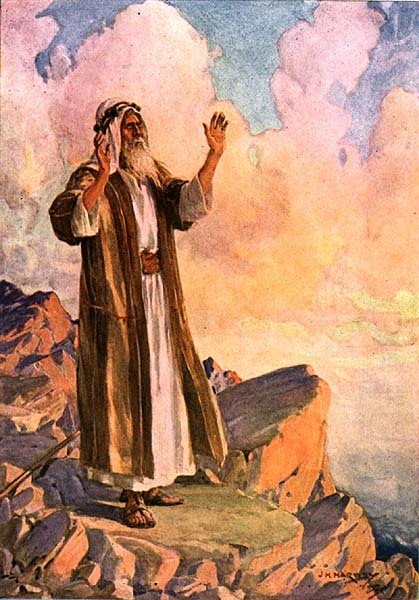 Moses does what every good leader would do next. Moses prayed to God to save his people. He took them before the Lord in a way as to stand in the gap for them and to intercede for them when they were not able or ready to go to the Lord. Leaders pray for their followers, there Bible study groups, their parents and families and intercede for them to the Lord. The reason Moses prayed for them was that he cared for them. They were under his care and his control. This came first nature to Moses because of the things we have seen from him and his past. Moses had just spent the last 40 years in the desert tending sheep, he was a shepherd to the people too. Just as we know a shepherd keeps his sheep out of danger from wild animals and other hazards, so does a shepherd of the flock on God look after his people who God has given care over. As leaders, teachers, and ministers of the gospel of Jesus we know that there are many dangers in the world that can take hold of God’s sheep and entrap them into places where there is little hope of escape. It is our job to look after them in ways to keep them safe from harm. One of the biggest ways to do that is to pray for them. The older I get the more I learn to be a silent prayer warrior for those under my shepherd staff of leadership. As I have grown in my knowledge of prayer and become more consistent in the practice of it, the more I am confident that it should be a first response rather than a last resort. The book of James shows us some basic principles of a godly and effective prayer life. I would encourage you to read it and notice the following principles. Pray with expectation that God will answer your prayers in His way. Is there any sin in your life that would keep your prayers from being heard? How earnestly do you pray? How often do you pray to God? Don’t just pray by yourself, involve the many to join you in prayer. Pray for those when God puts them on your heart. Don’t wait. There are so many great examples of others that went before the Lord and prayed for the people of God to wake up, to move, to stop sinning, to work together, to stand firm, and more for the Lord. Moses prayed for God’s mercy to be on the people and for him to “relent” his decision to destroy them all. (v.11-13) In verse 14 it tells us that God did relent in his decision to destroy them all. This can not be over looked here. Do you understand that the prayer of one man brought earnestly before the Lord caused God to relent of his decision for the people. Know that when you go before the Lord that God listens to your plea for the people you are praying for and he will respond to you as well. I am learning currently in a situation that I am going through right now that those prayers will often take a great deal of patience and waiting on the Lord and His timing. Often I want to jump ahead and try to do things in my own power and way, but I know God has called me into a season of prayer for the students I am over and I am asking God to move in their life and for them to get serious about their faith. I must trust God’s plan for each of them and His timing is perfect. This entry was posted on Thursday, February 18th, 2010 at 12:32 am and is filed under Leadership. You can follow any responses to this entry through the RSS 2.0 feed. You can leave a response, or trackback from your own site.